Kishan Munroe has introduced a painting to the catalogue of the artwork of The Bahamas that will stand as a national monument, commemorating all the brave servicemen who served on HMBS Flamingo when it was attacked and sank in 1980. 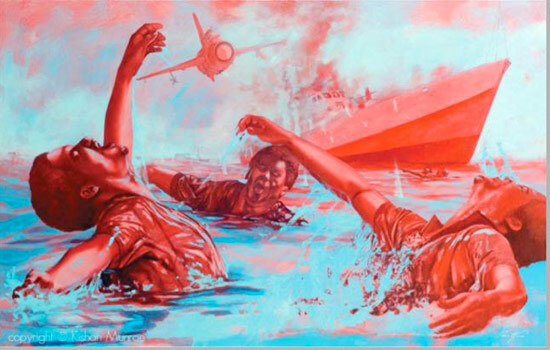 Munroe’s “The Sinking of HMBS Flamingo” is a stark reminder of the deadliest combat action seen by the Royal Bahamas Defence Force. On May 10, 1980, HMBS Flamingo arrested two Cuban fishing vessels for poaching in Bahamian waters. In retaliation, two Cuban fighter planes invaded Bahamian airspace and fired on the patrol boat. The Cubans sank the ship and fired on the marines still floundering in the water as they attempted to escape the attack on Flamingo. RBDF officers Fenrick Sturrup, Austin Smith, David Tucker and Edward William were killed in the attack. Fourteen other crewmen and the ship’s captain made it safely to Ragged Island, after boarding one of the fishing vessels they had apprehended. The poachers were convicted in July 1980, and Cuba eventually admitted responsibility, paying reparations to The Bahamas for the loss of life and the HMBS Flamingo. “The Sinking of HMBS Flamingo” is a continuation of the groundbreaking work that resulted from the years of research and collaboration that was unveiled to the nation in Munroe’s multi-disciplinary project, “Swan Song of the Flamingo”. “The Sinking of HMBS Flamingo” was created specifically for the Royal Bahamas Defence Force and unveiled during the anniversary ceremony of the sinking of The Flamingo at the Coral Harbor Base. In this powerful work, Munroe captures a dynamic scene incorporating both heart-wrenching desperation and vivid beauty. The painting demands its viewers to place themselves within the eerie scene as they are suspended at eye level, confronted by struggling figures dashing about almost beckoning for the viewers help. One almost feels compelled to duck as the menacing Cuban MiG jet flies over, seemingly escaping the canvas as it strafes helpless marines bleeding in the water. The Defence Force officers are forced to abandon their beloved ship as they plunge into uncertainty. Billowing plumes of smoke escape the wrecked Flamingo, motionless and on fire. Riddled with machine gun fire, tiny plumes of smoke are emitted from the ship’s body, hinting at the damage the Flamingo sustained and the smoldering inferno contained within its bowels. In a fight to maintain balance, the distressed Flamingo raises its bow as it slips beneath the secretive seas; her unfortunate demise however, is inevitable as her story is muffled by the abyss she would plummet into. In the background one marine assists another, who is floating apparently lifeless beside him. He points to the left of the canvas where the viewer is directed to the two captured Cuban ferrocemento vessels in the distance being towed by Flamingo as it is attacked. This subtle implication of the figure pointing directs the viewer to the continuation of the saga: they must make the treacherous journey towards their only hope for salvation. The piece is a continuation of Munroe’s more than three-year dedication to the documentation and telling of the Flamingo story. His multi-disciplinary project, “Swan Song of the Flamingo” delves into the series of unfortunate events that led up to and followed the sinking of HMBS Flamingo. Based on the findings of his in-depth investigations, he has created a body of work that visually depicts the incidents as described by the survivors themselves.The work has become a monument to the lives of those servicemen who died in the attack on HMBS Flamingo as well as the survivors. This unprecedented creative collaboration had Munroe work closely with elite squadrons of the Royal Bahamas Defence Force. Munroe became a forensic artist of sorts conducting months of research and carefully dissecting information to produce the pieces that are now hailed as national treasures. The culmination of years of work lead to the groundbreaking exhibition “Swan Song of the Flamingo” held at the National Art Gallery of The Bahamas in November of 2013. In attendance at the unveiling were Minister of National Security, Dr. Bernard Nottage, Commodore of the Defence Force Roderick Bowe, Lady Marguerite Pindling, Permanent Secretary in the Ministry of National Security Carl Smith, survivors and family of those lost during the attack on the Flamingo. John Dinkelman, chargè d’Affaires for the U.S. Embassy Nassau and other officials from the U.S. government were present as well. About Kishan Munroe: Munroe (born 1980, Nassau, Bahamas) is a socially conscious artist whose goal is to transcend the boundaries of language and culture in order to create artwork that can be understood as activism. In 2003 Munroe obtained BFA degrees in painting and 3D visual effects at Savannah College of Art and Design. He went on to pursue graduate work at his alma mater on a graduate fellowship and concluded his studies in painting in 2005. Munroe’s work has been exhibited in the Caribbean, North America and Latin America.His work is included in many public and private collections and has also received numerous awards and accolades. On August 21, 2008, Munroe, embarked upon a multi-media expedition entitled “The Universal Human Experience” – the first ever project of this magnitude attempted by a solo artist. With paintbrush and camera in hand Munroe has planned an ambitious trek around the world. Through his imagery, he tells the many and varied stories of human struggles and triumphs in the hope of finding a common ground. Munroe is based in Nassau, Bahamas but will be a global citizen for the next few years.